Hello! It's time for a new Mojo Monday sketch (#195).. I hope you will join us this week! I used Thankful Accents on my card today. I stamped and clear embossed the doodled frame, then I cut it out with a Spellbinder's Standard Circle die. While it was still in the die, I sponged over the frame to create an emboss resist effect. I made this card for Julee, who suprised me with some stamping goodies for my birthday.. thanks SO much Julee! Accessories: Standard Circles, Lacey Circle Nestabilities, Big Scalloped Borderabilities Petite (Spellbinders); Clear embossing powder, Twien (May Arts), Pearls (Kaisercraft), Roses (Recollections), Foam tape, Thread, Sewing machine. OMG, that is soooo beautiful Steph! So beautiful Stephanie! 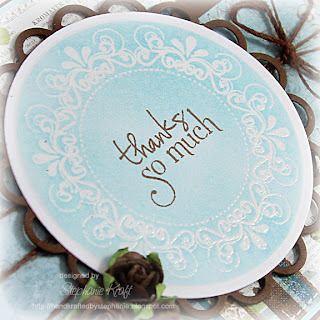 Love the ornate stamped image and how you layered it with a lacy circle! Such pretty patterned paper! Thanks for the inspiration! When I first looked at your card I thought it would be great for a masculine card. But then I looked at that gorgeous embossed circle with the sentiment...And now? It's a feminine card with gorgeous papers and an elegant touch. Love it! Yummy papers and card. Lovely use of the sketch! simply gorgeous! i so love everything on this card--beautiful embossed sentiment and lovely bkgd paper! Lovely card, very nice paper to work with, right? I used the same for my take on the sketch! Wow! Pretty Pretty Miss Stephanie! Love the colors yoru chose , So pretty together.